Palo Alto Networks security platform provides hundreds of capabilities for reducing the attack surface of healthcare organizations - But which ones should you focus on implementing first? 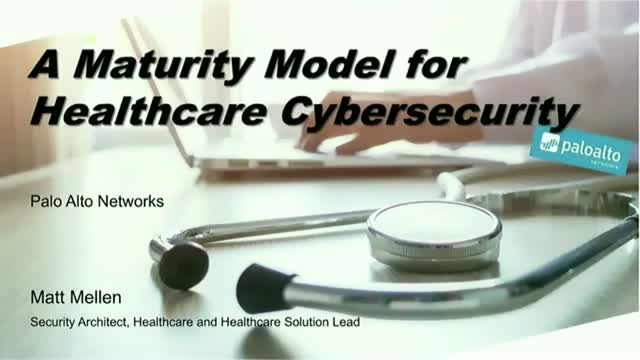 Join us for this webinar presenting the Healthcare Maturity Model, by Matt Mellen, a former security operations lead at a hospital in California. The maturity model outlines critical security capabilities that every healthcare organization should have deployed. A variety of security capabilities will be discussed in the context of healthcare environments, like SSL-decryption, geo-based blocking, DNS sinkholing and many more. The security capabilities will be split into 4 levels of increasing ‘maturity’ in order to help healthcare orgs prioritize which should be implemented first (levels 1 and 2), and which are more appropriate in more mature security architectures (levels 3 and 4). In addition to helping you prioritize the security capabilities that should be enabled in your organization, you’ll get a better idea of the breadth of security functions that the security platform provides in a healthcare environment.